Middle Earth is full of different species and creates and many legends, great stories and the possibility of an amazing adventure. Frodo Baggins a Hobbit who lives in the shire ends up having an ancient ring in his possession which is actually the one ring. The one ring is the ring which was made by the dark lord Sauron who wanted to use the ring to rule the whole of middle earth. When the ring is uncovered by the create Gollum to be in the Shire, Frodo must leave but he is not alone. Other Hobbits Sam, Merry and Pippin end up on the quest to leave Hobbiton and the Shire to meet Gandalf the Wizard. That does not go to plan when Gandalf is not at the place they are due to meet, a ranger who is refered to as Strider but later revealed as Aragorn who is heir to the throne of Gondor and the King of all men. He helps them to Rivendale to see the Elves and meet up with Gandalf. This is when the Fellowship of the ring is formed which is made up of the 4 Hobbits, Gandalf the Wizard, Gimil a Dwarf, Legolas an Elf and two men Aragorn and Boromir of Gondor. The quest of the fellowship is to destroy the ring. The quest takes them over difficult roads in which they have Wizard Saurman working against them in an attempt to make it all more difficult for the Fellowship. They must travel through the mines of Moria which was once a Dwarf mine . . . although now it is more of a tomb after the orc’s took it from the Dwarves. This brings the first main fighting scenes with bows and arrows and a lot of fighting. It is not over however as when they are close to escaping from Moria, Gandalf comes up against the Balrog and does not make it out of Moria. The fellowship continue to Lothlórien and are helped by Lady Galadriel and use the water to continue their journey. Saurman has created an army to hunt the fellowship made of Urkiai which are stronger than Orcs. This sees the fellowship being split when Boromir dies and Frodo leaves to head to Mordor alone . . . well until Sam gives him no choice but to let him leave. Aragorn, Gimil and Legolas decide to track the Urikai who took Merry and Pippin with them. I really find this film to be an amazing adventure film, it really doesn’t get any better than this. Seeing a fellowship formed to set off on a quest and form friendships. Helping each other out and experiencing many things which they never imagined possible, especially in the case of the Hobbits. It really does make you feel part of the fellowship and you want them to get the ring to Mordor as part of the quest. The character build up in this film is part of the plus as well, making you really care about each character and understand the differences in the species which live in middle earth. It really does have a little of everything in this film. Parts to make you jump, make you laugh, make you cry and even a glimpse into the love story between Aragorn and Arwen. It really does set everything in a good direction for the second and third installment setting the groundwork of character development. 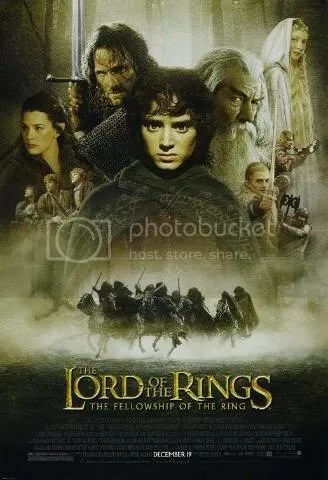 This is the film which really got me into watching all types of films and really begin to appreciate cinema, so I do owe a lot to Peter Jackson for bringing the trilogy to the big screen. Especially with the extended edition of the DVD which I actually watched everything on it. I really started to get into how the film was made how they done certain things and just totally fell in love with cinema. Pretty Boy Actors: A Curse? Good review, Caz. Funny that my hubby mentioned/ LOTR several times in his review on Clash of the Titans (he’s my guest blogger for today). I thought that this movie was so well-done from the standpoint of the script, acting, cinematography, etc. It’s a beautiful movie to look at but it’s also got a poignant and deep story to go with it, which is what a lot of movies lack these days. Kudos to Peter Jackson for pulling off such a formidable task. That’s cool that this movie really makes you fall in love with cinema, for me that was Gone with the Wind and Ben Hur. I must check out Clash of the Titans then if he mentioned LOTR several times in it! Totally agree that a lot of films now lack a good deep story. LOTR was true to the vision and tone created in the book–that’s why it succeeded so well. Definitely agree, it’s so great to watch. It’s my favorite of the bunch because of the great mix of laughs, hopefulness and anticipation of the dark and adventurous things to come. Very epic. Yeah I have found that it seems to often be regarded as the favorite of the three films, mainly because of the whole adventure it sets up. Just brilliant! Nice write up Caz!! The more I watch this the more I just love it. Took one hell of an effort to bring this to the screen and it was done so damn well. Jackson is a phenomenal director and the adaptation, in my eyes, fared well with fans of the book and newbies. I also see it as a great pairing of practical effects and CGI that didn’t feel forced and really helped the story. Lots of films use CGI as a crutch but LotR worked very well and it was seamless. Oh, and thanks for the Blogroll add, I’ve done the same:) Have a great weekend! Yeah I couldn’t even imagine how difficult it must have been to bring it to the screen. Adapting it from the books whilst keeping the brilliant adventure. Yeah the effects and CGI really did work very well, and possibly helped start off a whole new type of film with the way they used it. Stunning write up. There are so many moments to remember here; The prologue narrated by Galadriel, Bilbo’s birthday, Arwen riding to save Frodo, the inception of the Fellowship, the cave troll. I could list so many more but I think I’d be here all day. Oh totally so many moments, your certainly making me want to watch them all again properly! I plan to view them all very soon to be transported back to a magical place of wonder. Do you watch the extended versions or the theatrical cut? I haven’t seen the extended versions, though my brother keeps informing me I need to rectify that. You certainly do, we get so many more brilliant moments and it let’s you know the characters even more! I’ll make it my mission to watch the extended versions. You will be even more taken in by Middle Earth! Oh I can’t wait to be immersed once more in Middle Earth.